The room is awesome. The staff is kind and professional. the location is great. And I can't say enough about it. Where to find Saint-Tropez hotels near an airport? How can I find hotels in different Saint-Tropez neighborhoods? 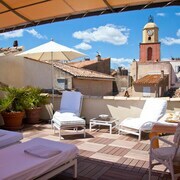 Where can I find hotels in Saint-Tropez that are near tourist attractions? If you're after upscale or affordable establishments in or around Saint-Tropez, it is useful to know that there is a wide range of options. On our comprehensive database you can search 98 places to base yourself within a 0.1-kilometre (0.06-mile) radius of Saint-Tropez's center. 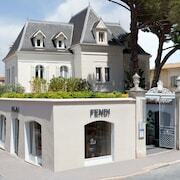 Securing a place to base yourself in central Saint-Tropez is only a mouse click or two away. Expedia's comprehensive database features the La Bastide de Saint Tropez and Hôtel de Paris Saint-Tropez, which are situated within 1 kilometre (0.6 miles) of Saint-Tropez's city center. For accommodation that is in the vicinity of the Saint Tropez Citadel, you could investigate the Château de la Messardière or the La Résidence de la Pinède. The Château de la Messardière is 2 kilometres (1 mile) away and the La Résidence de la Pinède is 2 kilometres (1 mile) away. Hoping to identify budget hotels? You might like to explore the Benkirai Hotel, Le Mandala and Mas Bellevue. You could investigate the Althoff Hotel Villa Belrose as well as the Hotel Saint Amour - La Tartane. The Althoff Hotel Villa Belrose is located 3 kilometres (2 miles) away from the main part of Saint-Tropez. 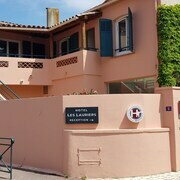 The Hotel Saint Amour - La Tartane, is situated 3 kilometres (2 miles) away. The Villa Marie and the Hotel SEZZ Saint-Tropez are two more Expedia-listed Expedia-listed accommodations in Saint-Tropez. After you have spent time in Saint-Tropez, ensure you allow time visit Provence - Alpes - Cote d'Azur's other great offerings. Provence - Alpes - Cote d'Azur offers rural landscapes. Popular Provence - Alpes - Cote d'Azur tourist destinations include ruins. In this section of France visitors might also partake in picnicking and sunbathing. Grimaud is 8 kilometres (5 miles) to the west of Saint-Tropez and is where you'll find Chateau de Grimaud and Grimaud Beach. 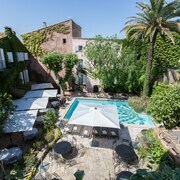 If you'd like to stay in Grimaud, check out the Hôtel Font Mourier and Le Verger Maelvi. Or, you could consider staying in Rayol-Canadel-sur-Mer, 18 kilometres (11 miles) to the southwest of Saint-Tropez, where you can pick from the Le Bailli de Suffren and Les Terrasses du Bailli Hôtel. The Pramousquier Beach and Domaine du Rayol are a couple of the more popular attractions to check out when visiting Rayol-Canadel-sur-Mer. If you are arriving or departing through Toulon - Hyeres Airport, you might like to book some accommodation at Mercure Hyeres Centre, or Casino Hotel des Palmiers, both of which are a short distance away. What are the most popular Saint-Tropez hotels? Are there hotels in other cities near Saint-Tropez? 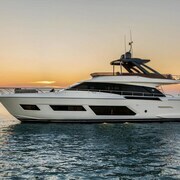 What other types of accommodations are available in Saint-Tropez? Explore Saint-Tropez with Expedia.ca’s Travel Guides to find the best flights, cars, holiday packages and more!